Kumarakom can be reached by road from Trivandrum in four hours, from Kochi in one and half-hours and in fifteen minutes from Kottayam, which is 16 kms from Kumarakom. The nearest airport is Cochin, which is 80 kms away and Kottayam is the nearest railway head. Unbelievably beautiful emerald paddy fields, pulsating mangrove forests, coconut groves and canopies and enchanting waterways and canals decked with white lilies - little wonder that Kumaralom is considered paradise on earth. Forty two of the forty four freshwater rivers originating in the Western Ghats flow eastwards forming an intricate network of waterways. Backwaters are formed when these rivers empty themselves into the Arabian Sea. Kumarakom is perched on the western banks of the Vembanad Lake and has about 900 sq. kms of backwater ripples spread endlessly into the horizon. Kumarakom is a fascinating hamlet where tradition and modernity go hand in hand. A blend of tradition and culture is interwoven in the lives of the natives living in ancient rustic homes with temples and churches. At the same time, you can spot tourists glide through the canoe, motorboat or houseboats and accommodated in state of the art guesthouses, hotels and resorts. 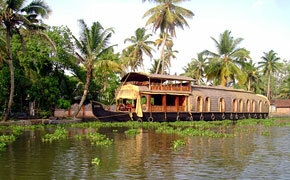 Kumarakom is famous for houseboat cruises on the backwaters. Plenty of thatched houseboats, cormorants and canoes take you to the heart of these scenic backwaters. The tourist can enjoy and out of this world experience at Kumarakom in the traditional 'Kettuvallams' houseboats. Jack wood planks are joined together with coir rope and coated with black resin made from cashewnut shells to form these boats that do not have a single nail on them. Sailing through the coconut palm fringed river sides reflecting in the glassy waters, a tourist can watch hundreds of white lilies, multi hued birds and freshwater fishes. Taking a voyage down the amazing backwaters is the best way to enjoy the romantic ambience of Kumarakom backwaters. The Kumarakom Bird sanctuary is a favorite haunt of migratory birds. Spread across fourteen acres of land close to Kumarakom, this bird sanctuary is a paradise for ornithologists. Egrets, darters, herons, teal, waterfowl, cuckoo, wild duck and several migratory birds like the Siberian stork are regular visitors. There are multi cuisine restaurants standing on the stilts over the lakes that offer unique dining experiences amidst the serene backwater environs in Kumarakom. The specialty is freshwater fish and tapioca. 'Karimeen' (Pearl Spot) is a common freshwater fish in Kumarakom area. Kumarakom enjoys a well-balanced tropical climate. The local spring season is from August and this coincides with Onam, the harvest festival in Kerala. The peak tourist season is from November to March. Slight drizzles persist till early November. A cool fresh breeze always seems to blow the backwaters.